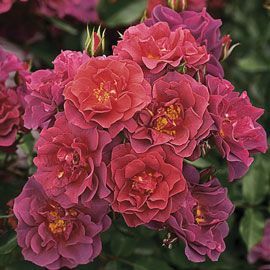 Cinco De Mayo Floribunda Rose | Henry Field's Seed & Nursery Co. Very free-flowering all year long. Huge clusters of mysteriously unique rusty red-orange and smoky lavender blooms just never stop poppin' open on this powerful floribunda. A true rainbow of colors, Cinco de Mayo is perfectly blendable with any color in the garden. The super-clean glossy-green foliage and delectable fragrance complement the exceptional flower power. U.S. Patent No. 21709. Bareroot No 1. to 1 1/2 grade. Depth: Plant so that the crown is at the same level as the soil. Color: Smoky Lavender and rusty red-orange blend. Smoky color intesifies with cooler temperatures. Flower Form: Large, ruffled, double flowers. Medium, in large clusters, about 25 petals in clusters of 5 - 9. 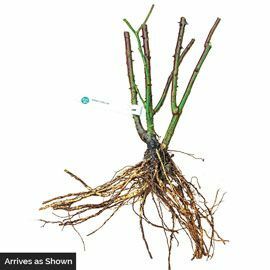 Pruning: Prune to maintain shape and increase branching once the plant is established. Remove any dead or damaged branches. Size: Flowers are up to 3 1/2 inches across.